IMG_0636, originally uploaded by catelinp. I had my friends take a photo of me after my concert on Saturday night to prove that I actually played in public with an orchestra for the first time in about a decade. 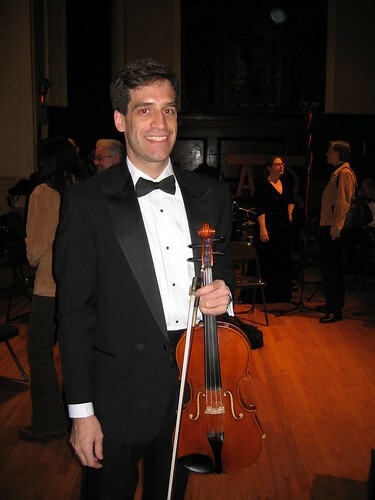 Also, I don't have any recent photos of me all dressed up and with my viola, so here we are. The concert was a complete success. My friends enjoyed it, and we got several ovations at the end. I'm happier than I can express in words to have been a part of it. For everyone who had something else to do tonight, the next concert is Mahler's 3rd Symphony on December 16. Mark your calendars now. I know it's the height of Christmas party season. That's why I'm getting the word out now, so you can tell people "I can't come to your party, I've got to hear my friend Phil play Mahler." It's going to be fantastic. Bravo, bravo! Glad that Creighton and I could be there - I'll let him know his photo's on your blog, in case he hasn't checked yet. It's a shame the cathedral makes him work late during the holidays, but I should be at the gala on the 16th - looking forward to it too.